new to tsw products? this is a great sampler. portable & convenient for sensitive and multi surfaces. Developed to Remove: Graffiti and stains consisting of oil and latex paints, paint over spray, permanent marker, pen, inks, lipstick, correction fluid, tar, oil and more! Packaging: Clamshell container holds 1 -4oz Mister Bottle of TSW9 Plasti-Master, 1 -4oz. Mister Bottle of TSW2 Multi-Master and 1 -4oz Mister Bottle of TSW7 Neutralizer. 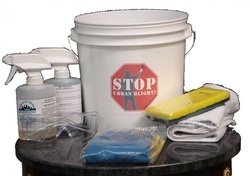 Packaging: 2 Gallon Stop Urban Blight bucket with lid, 10oz. TSW2 Multi-Master, 10oz. TSW7 Neutralizer, Chemical and Solvent Resistant Gloves and Glasses, Terry Towels, and Industrial Strength Scrub brush. THIS PRODUCT IS AVAILABLE FOR PURCHASE ONLINE ONLY!